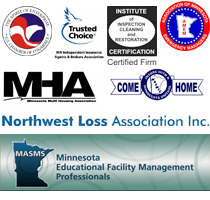 ServiceMaster Professional Services has been leading restoration and cleaning professionals in Hutchinson, Minnesota for over 50 years. With locations in several areas, they are ready to meet your commercial cleaning and janitorial needs at any time. They have the highest level of training along with decades of experience as they work with people and businesses. They are experts at problem solving, not only in meeting their client’s needs (including quick response and cost savings) but responding when unforeseen challenges arise. In their commitment to doing business the right way and turning ordinary tasks into extraordinary service, ServiceMaster Clean is proud to offer environmentally conscious, green cleaning options for all of your commercial and janitorial cleaning needs. ServiceMaster Professional Services provide janitorial services, office cleaning, building maintenance and other commercial cleaning services in Hutchinson, Minnesota. If you are a property manager, condominium or building trustee, a proud business owner or business manager, ServiceMaster Professional Services will efficiently serve all your janitorial needs. Call (612) 503-8703 today!